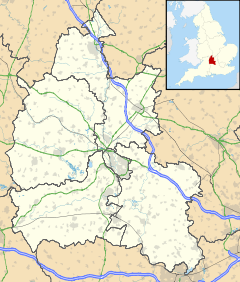 North Newington is a village and civil parish in northern Oxfordshire, England, about 2 miles (3.2 km) west of Banbury. North Newington is in the Church of England parish of St Mary the Virgin, Broughton With North Newington. The parish church is in the grounds of Broughton Castle, 1 mile (1.6 km) south of North Newington. North Newington's most notable historic building is Park Farm, whose main house includes buttresses and other features from the 14th or 15th century. Park Farm has also a circular dovecote that was built in the 17th century. A village school was built in 1853 and is now Bishop Carpenter Church of England primary school. The school celebrated its sesquicentenary in 2003 with an open day at which it invited all old pupils to come back and share memories, and also the day was combined with a Village History Day which showed how the village has developed since records began. North Newington has one public house, The Blinking Owl. ^ "Area: North Newington CP (Parish): Parish Headcounts". Neighbourhood Statistics. Office for National Statistics. Retrieved 8 March 2010. ^ Sherwood, Jennifer; Pevsner, Nikolaus (1974). The Buildings of England: Oxfordshire. Harmondsworth: Penguin Books. p. 498. ISBN 0-14-071045-0. This page was last edited on 2 April 2017, at 23:37 (UTC).